Happy New Year! We're delighted to share another clip from the 2016 Festival – The Prelude of Sir Edward Elgar’s The Dream of Gerontius. From the 2016 Southwell Music Festival, here is the Prelude to The Dream of Gerontius by Edward Elgar, performed by Southwell Festival Sinfonia. In July we recorded a concert for the Michael Cuddigan Trust at Aldeburgh Parish Church, which included the world premiere of Songs Without, a piece commissioned by the Michael Cuddigan Trust, by Jordan Hunt (@jordanhuntmusic). This year we were asked to make 12 videos for the Twelve Days of Christmas 2015, a selection of highlights from what was an amazing festival! Camera man Tom‘s favourite was undoubtedly the Ades (day 8! ), and Producer Alexander rather enjoyed making the Haydn (day 11). Siglo de Oro recorded these videos in the run up to their concert at St John’s Smith Square in December 2015. Earlier this year Alexander Barnes produced and engineered this session withComposer and Producer Oliver Davis for Signum Records, featuring Kerenza Peacock violin Grace Davidson soprano and Ivor Setterfield conducting Trafalgar Sinfonia. This video Edited and Produced by Alexander Barnes, filmed by Tom Maine. 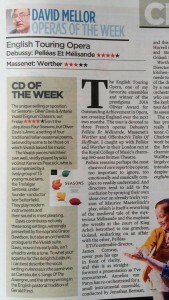 Seasons has been recommended by David Mellor as the CD OF THE WEEK in the Mail on Sunday 11 October 2015. We are often asked to make videos for auditions, which have very strict requirements: Videos have to be one continuous take, with no changes of angle or edits made to the audio.